Redshirt freshman quarterback Clayton Thorson drops back to pass. Thorson was benched briefly in the second half Saturday after a rough day throwing the ball. A home game against a bottom-tier Big Ten opponent Saturday led many predict a blowout. 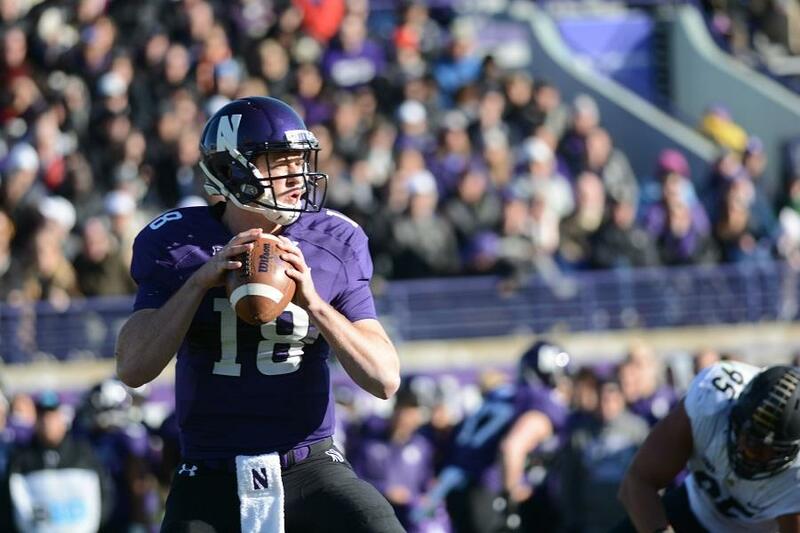 But Northwestern’s offense, or lack thereof, ensured that the 21-14 win over Purdue was anything but a cakewalk. After a three-quarter performance that saw him throw for just 69 yards and an interception, redshirt freshman quarterback Clayton Thorson was pulled in favor of senior quarterback Zack Oliver, who proceeded to throw an interception of his own. Thorson would return after another unsuccessful drive by Oliver and lead the offense on the game-winning touchdown drive. The Cats accumulated 250 yards on the ground but weren’t able to string positive plays consistently and struggled on third down, particularly in the second and third quarters. The problems with NU’s pass offense looked similar to games past. NU’s receivers were rarely open down the field, giving Thorson limited options to throw the ball. No Cats receiver had more than two catches. In addition, Thorson continued to leave the pocket with haste. On his interception, Purdue sent a blitz, but sophomore running back Solomon Vault picked it up perfectly. Before the play could develop, Thorson rolled out, limiting his options to senior wideouts Miles Shuler and Christian Jones. With such a tight window to throw into, Thorson’s pass to Jones was tipped and intercepted. He was pulled from the game in favor of Oliver on NU’s next offensive drive, a decision that left many Cats fans scratching their heads. “We just felt like we wanted to take (Thorson) out and give him a breather,” Fitzgerald said, also mentioning that had Oliver scored on his drive, Thorson might not have returned. But eventually the NU ground game, and Thorson’s legs in particular, won the game. Thorson rushed for 48 yards on seven carries, with two impressive 16 yard runs on the go-ahead touchdown drive. Although Thorson has been a great weapon on the ground, the Cats simply cannot rely on only the running game and expect to beat good teams. NU will close its final two games of the regular season against two top-10 defenses in Wisconsin and Illinois. Some semblance of a passing offense will be critical in those contests.